The biggest accomplishment of the Historical Society since its re-institution in 2002 is the partnership we have formed with the City of Wilton Manors, City Commission, City Manager, and the Leisure Services Departments. We work together to burnish Wilton Manors’ image, making it an even more attractive place to live and work. le, and on the internet from retailers like Amazon.com. Important off-shoots of the book are a greatly expanded photo collection and old newspaper collections. For the most part, these are all digitized. These collections are a big ongoing effort. The Society sponsored a photo contest, which not only produced a number of superb new pictures of Wilton Manors, but also unearthed a number of historically significant pictures. We regularly put on photo exhibits for various City Events. The Society has provided a great deal of input on the refurbishing of the Richardson Park Manor House and has gone to great lengths to give it some “Wilton Manors Personality” so it is not just another empty white box available for rent. We have worked with the Richardson family as they have transitioned out of their home of more than 70 years. The Richardson family has most generously provided the Society with a number of artifacts and important documents from the family and golf course. We worked with the Woman’s Club with their difficult decision on the future of the building famously established by Al and Ginny Hagen and Clayton and Lou Leavor. We worked with them to find appropriate homes for sixty years of artifacts required for the many parties sponsored by the Club. Your Historical Society will be thanked by the WMHS of 2047! We took a lot of detailed photos of the inside of the old City Hall, while it was still functioning. With the City Finance Director Lisa Rabon and Bob Mays, the Historical Society coordinated the sale of the detritus of the insides of the old City Hall. There was a market for file cabinets, but not desks. The nice desk chairs went quickly. The Dade County Pine wasn’t. Scrap metal dealers do not pick up, they want you to deliver. (Diane’s Trinidadian friend picked up!) Cindy Newton played Craig’s List like a Stradivarius. The end result was $10,000 contributed to the Island City Foundation and thousands of dollars worth of “in kind” volunteer labor. The Society continues to push for perfection, particularly at Richardson Park. We have worked closely with the Leisure Services Department and contractors at Richardson on things like the pavers for the various patios and walkways. Typically, a “historical society” will be chartered to “preserve, protect, and educate about the past.” The Wilton Manors Historical Society takes that very seriously. But we are also looking to the future. We hired a preservation architect and engineer to evaluate the Carriage House at Richardson to determine possible future uses of the building. The Historical Society serves a critical role in “marketing” Wilton Manors to residents, potential residents, residents of Broward County, and nationally. By publicizing the history of our City – the pioneers who developed our institutions and neighborhoods, the evolution of our City government, and both public and private structures which are reminders of our past – the Society brings a sense of community to our Island City. Through its articles, books, website, awards, and presence at public events, the Society offers a positive message in celebrating the continuing contributions of individuals, businesses and local government. There is a lot to be proud of in Wilton Manors. Monthly meetings are held the third Thursday of the month at 7:00 pm, generally in the City Commission Chambers at City Hall. 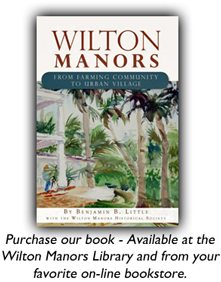 The Historical Society is always interested in photographs of Wilton Manors, stories about "the old days," and any other information or materials relating to the history of Wilton Manors.